Progressive rock giant King Crimson has a long and convoluted history. Founded in 1969 by iconoclastic guitarist Robert Fripp, the group has gone through numerous breakups, reorganizations and lineups of varying character. The current King Crimson configuration is generally considered to be its eighth, or perhaps an expanded version of is eighth: along with mainstay Fripp, the “eight-headed beast” includes guitarist/vocalist Jakko Jakszyk, sax/reed man Mel Collins, bassist/Chapman Stick player extraordinaire Tony Levin, and four – yes, four – drummers: Bill Rieflin, Jeremy Stacey, Gavin Harrison and Pat Mastelotto (these days Rieflin has shifted to keyboards). As Fripp is fond of saying, King Crimson has always been more a way of doing things than a group. The band’s sound has shifted radically over the years; the only constant has been a steadfast collective determination to go its own way, chart its own musical path. It’s easy to find artists whose musical approaches owe a debt to King Crimson’s styles; it’s rather more daunting a proposition to pinpoint anyone who’s influenced the uncompromisingly original King Crimson. The group has been around in its various permutations so long that it can claim to have influenced many of its current members when they were mere teenagers. Drummer Pat Mastelotto was 14 when he first heard “Cat Food,” a twisted, jazzy number from 1970’s In the Wake of Poseidon. “I was at the public library,” he recalls. “You could listen to vinyl there on headphones, and I would just randomly listen to things that I wouldn’t hear on the radio or see in the record store.” Soon he tracked down an 8-track copy of the band’s 1969 debut album, In the Court of the Crimson King. He was hooked. Amid a long and successful career as a session drummer for artists as diverse as Al Jarreau, XTC, Eddie Money and Robyn Hitchcock, Mastelotto scored success as a founding member of Mr. Mister, and has been in every lineup of King Crimson since 1994. He ran right out and bought In the Wake of Poseidon, and managed to see an early lineup of the band live when he was only 13. He says the experience was life-changing. “It made me think, ‘this is what I want to do’, whatever this is,” he says. He told himself, “Music like this, music inspired by this: this is going to be my life.” And so it would be: he’d eventually lend his considerable talents to music from Level 42, the Kinks, Tom Robinson and Dave Stewart, among many others. 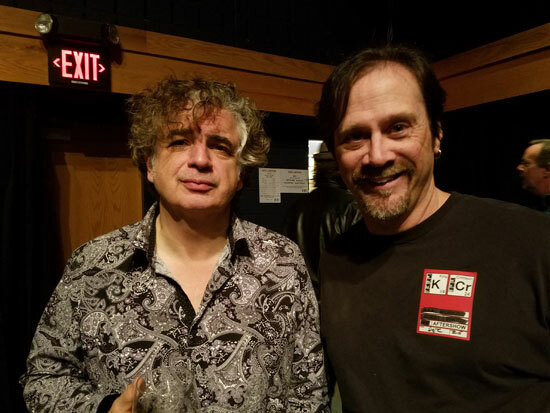 In 2002, Jakszyk formed 21st Century Schizoid Band, a tribute group of sorts that featured King Crimson alumni, most notably members of the earliest lineups including original drummer Michael Giles (Giles is also Jakszyk’s father-in-law). 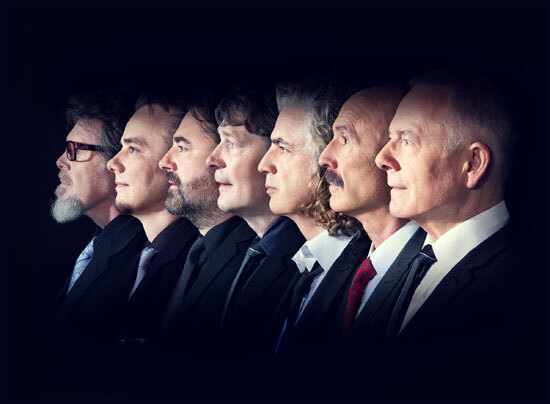 That experience playing the music of his heroes eventually led to a 2010 collaboration with Fripp and Collins himself; that in turn led to his being recruited as lead vocalist and guitarist when Robert Fripp ended his retirement and announced a re-formed King Crimson in 2013. When King Crimson started, it was a British group. But that began to change in the 1980s when a four-man lineup (Fripp, Levin, Adrian Belew and Bill Bruford) got together for three highly-regarded albums. Both Belew and Levin are Americans. And the current lineup features five Britons and three Americans (Mastelotto, Bill Rieflin and Levin). Levin is – and has been for years – one of the busiest and most in-demand musicians in any genre. His work is featured on more than 500 albums; he’s been with King Crimson for most of its projects since 1981, and in addition to his packed calendar, he’s a member of the instrumental prog trio Stick Men with Mastelotto and touch guitarist Markus Reuter. …and now there are eight. While there have certainly been exceptions, for the most part, the successive King Crimson lineups have largely focused on new material. The group seemed to have a policy of avoiding previously-covered ground. Speaking about the “double duo” lineup of 2000 (Fripp, Belew, Mastelotto and Trey Gunn), Mastelotto notes that “Robert didn’t want to play anything from before Trey and I were involved.” But for the current run of dates, the eight-headed beast is tearing into the massive back catalog with relish.